John "Jack" Vincent Brennan was born on August 16, 1937 in Fall River, Massachusetts to John and Olympia (Malgieri) Brennan. The grandson of Irish (paternal) and Italian (maternal) immigrants, Brennan attended Coyle High School in Taunton, Massachusetts. Upon entering Providence College in 1955 to major in economics, he then enlisted in the United States Marine Corps reserve at Newport, R.I. in February of 1956. 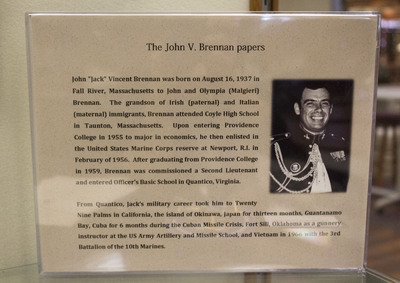 After graduating from Providence College in 1959, Brennan was commissioned a Second Lieutenant and entered Officer's Basic School in Quantico, Virginia.